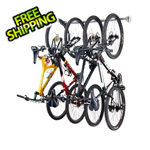 The 3 Bike Rack by Monkey Bars securely stores 3 bikes in a compact space. 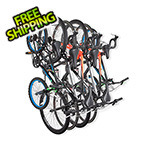 The 3 Bike Rack's ability to store 3 bikes is designed for long term storage, freeing up valuable floor space in your garage. 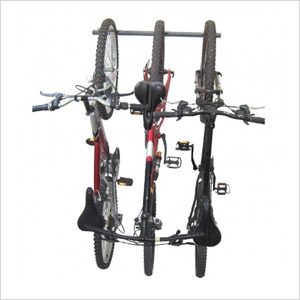 The hooks snap and slide along the bar allowing you to choose where to place the bikes along the rack. The hooks also contain a plastic coating to prevent scratches on your bikes.